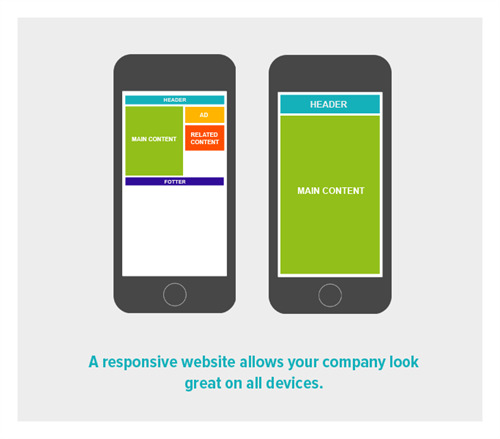 Web Site Design for all Devices | What is Responsive Design? Even on desktops, users might not use the full screen for their browsers but resized to share space with other applications. This means your carefully crafted home page might look quite different on their screens, raising questions about the visibility of your key messages and the appeal of your website. Your online presence might not be as effective as it could be. The traditional response to the challenge of a multi-device web has been to create “versions”, optimised for the devices making the bulk of visits to the average commercial website: desktops & smartphones. However, the speed of technological change means the number of versions would need to increase to the point they become less cost effective and hard to manage. Also, by the time the alternative versions are completed there’s likely to be a new device about to be released. The concept of responsive web design (RWD) has been explored for the last 2 years as the solution to the requirements of different viewing devices. Starting from a brilliant article on A List Apart (a website specialising in discussing the future of web design) the notion of RWD has become one of the dominant trends in the field. This approach is often combined with “Mobile First”, a strategic view for designing and building user interfaces, based on starting with the simplest layout for basic and small devices, with enhancements for more sophisticated platforms added later in the process. Although it makes a lot of sense, the main implication of responsive web design is the need for additional planning and investment, particularly when it comes to deciding how visual elements will be presented on ever-changing screens. This will present different challenges to existing and new web projects but it also offers exciting opportunities to those willing to adapt their presence and ensure their message comes across effectively for all their visitors… Except for the Nokia 6230 – but nobody’s perfect! Previous Post The importance of wireframing Next Post Should you use WordPress or Umbraco?